Boris, a 20-year-old bottlenose dolphin, sat quietly in his pen Friday while scientists tested his hearing. 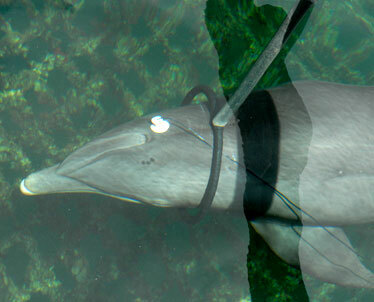 The electrode suction cups on his head record his brain wave patterns and measure what the dolphin hears. Wearing suction cups that pick up brain waves, Boris the dolphin obeys orders to put his head in a small ring underwater. A waterproof speaker dips into the water, sending out intermittent high-frequency signals. How Boris' brain waves respond to the sound is the focus of research under way at the Hawaii Institute of Marine Biology. Boris, a 20-year-old male bottlenose dolphin, demonstrated his role Friday morning to U.S. Rep. Neil Abercrombie and the news media as part of efforts to determine whether Navy sonar is harmful to marine mammals. Abercrombie said work by University of Hawaii scientists at Kaneohe Bay will help separate fact from fiction on the effects of sonar, deemed necessary to detect increasingly quiet foreign submarines. Abercrombie spent most of Friday morning at the institute's research facilities at Coconut Island, where three bottlenose dolphins and one false killer whale are involved in Paul Nachtigall's research on noise in the ocean. B.J. 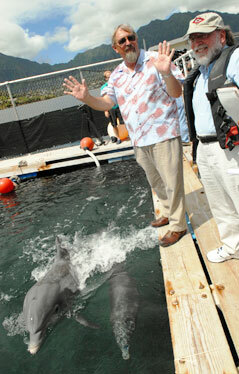 and her 7-month-old calf, Hoolono, welcomed Paul Nachtigall, left, and U.S. Rep. Neil Abercrombie at the Hawaii Institute of Marine Biology in Kaneohe Bay. The Hawaii Democrat's visit came on the heels of numerous court suits by environmentalists to block the Navy's use of sonar, which they say has killed whales and dolphins. The Navy has maintained that using sonar is part of crucial training during war games. "We are stewards of the planet," said Abercrombie, chairman of the House Armed Services Subcommittee on Air and Land Forces. "As a result, it is our obligation to try to get the right information together so we can decide the right course." Abercrombie said there is a $1 million appropriation pending before the U.S. House to support Nachtigall's research with marine mammals. An additional $3 million is proposed for BAE Systems to develop an airborne system capable of tracking the presence and movement of marine mammals, Abercrombie said. The company also would develop maps to identify channels used by whales and dolphins. Both Abercrombie and Nachtigall, director of the university's marine mammal research program, agreed that there is a need for good scientific information on the effect sonar has on marine mammals. Whatever course the Navy takes should be based on scientific fact and not on personal biases or opinions, the scientist and lawmaker said. Nachtigall said "sources of loud sounds in the ocean" are now caused by shipping, oil exploration and Navy sonar. His objective is to determine "how much sound is too much sound."